Bedroom with private bathroom access. This comfortable apartment has about 490 sq ft of living space, plus a private balcony area. It's perfect for a couple looking for a romantic getaway or a family of 4 on a budget. This unit can also connect to Apt. B1 through a secured access door to accommodate a group of up to 8 guests. Guests also have access to laundry facilities, and a shared roof-top terrace with BBQ grill and lounge area overlooking Sandy Beach. Apartment B2 is on the second level and has a private entrance, street level, at the back of the house. The bedroom has a queen size bed and quiet inverter air conditioning. There is a futon in the living area which can sleep up to 2 additional guests. The living area has cable tv and there is free Wi-Fi throughout. 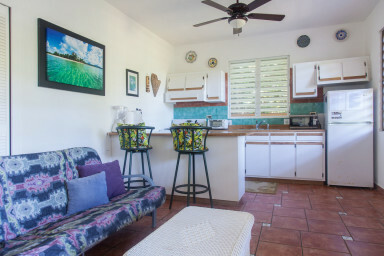 The kitchen is fully equipped with a full size stove, fridge, microwave, toaster, coffee maker, dishes, utensils, pots, pans, etc. This apartment has a private bathroom with a shower as well as an outdoor shower. A rental car is not necessary here since there are several places to eat and things to do within walking distance; however, it is recommended to get the most out of your stay. Taxi's are available on call, but sometimes car rental rates can be cheaper than cab fare to and from the airport.